With the PAPERAG, which is designed by TUNAPAPER, you can neatly organize your stationery and personal things in the room or office. You can make this DIY versatile box with just a simple assembly. remarkable and valuable cultural goods with inputting traditional spirit of Korea and general function accepted by contemporary world. [INQ. NO. 1304C01] PROUNA is an upmarket tableware brand launched in 2004 by Hankook Chinaware, Korea’s largest manufacturer of ceramic tableware. Hankook Chinaware has focused on the premium tableware market through PROUNA. HC Biotech Co., Ltd. (CEO Yoon Byung-jae) specializes in developing and manufacturing dietary supplements made by using Hamcho, a kind of halophyte (salt tolerant plant), which grows naturally, absorbing salty minerals in salt fields or on muddy seashores along Korea’s south and west coastline. Egarak Black Garlic Appealing to Health-conscious Consumers Worldwide! Located in Namhae-gun, in the southern part of the Korean peninsula, DukSan Black Food Co., Ltd. was established in 2007 to focus on high-value-added black garlic products by using its own “Egarak” brand name and self-developed fermentation and ripening method. Sinhwa Food specializes in manufacturing and exporting “jeotgal,” which is a type of Korea’s traditional seafood cuisine fermented in salt as well as a variety of Korean side dishes (banchan in Korean language). And, the banchan mainly uses home-grown vegetables pickled or fermented in soy sauce, pepper paste or bean paste for special flavor and preservation. Korea’s traditional seafood cuisine jeotgal is usually enjoyed as a side dish, a condiment in pickling kimchi or as a dipping sauce to enhance the flavor of a dish. For example, jeotgal is added to Korean style stews and soups for flavoring instead of using salt or soy sauce. 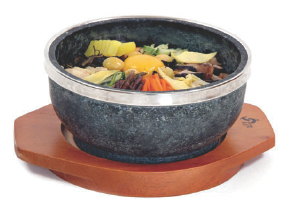 Since itsfoundation in 1985, Youngshin Stone Co. has been exclusively dedicated to manufacturing stone cookware. highly recognized for its outstanding features such as superior heat resistance and conductibility to other material. Well-known for its signature antiemetic “Kimite” patch at home and abroad, MyungMoon Pharm. Co. is a Korea-based company engaged in the manufacturing and distribution of highquality pharmaceuticals for the past 27 years, and it has achieved remarkable growth via constant research and development. GFC Co. is a cosmetics company that is committed to the R&D of functional cosmetic ingredients using Nano-technology based on Phytorism. Using its own technical expertise and long experience in developing cosmetics, GFC engages in developing and manufacturing products for cosmetic base material, natural substances and finished products. Miin Co. is a manufacturer and exporter of UV protection cosmetics in Korea. Since its foundation in 2006, the company has been exclusively dedicated to developing and producing highfunctional sunblock creams. Its products are highly rated in Malaysia, Taiwan, Mexico, and China, as well as in Korea.